Priced: $69.99 - $160.00 Rated: - 5 stars out of 5 by 21 reviews. Salomon XA Pro 3D Ultra 2 Trail-Running Shoes for Women Features. Salomon XA Pro 3D Ultra 2 Trail-Running Shoes for Women. The Salomon XA Pro 3D Ultra 2 Trail-Running Shoes for Women are ideal for the avid runner. These shoes are designed with the energy cell 2 technology for a better performance and stability control. The quick-drying breathable mesh upper keeps you fresh and debris-free. Thanks to the sensifit and quicklace system with lace pocket, you can adjust them for a better and secure fit. These trail-running shoes incorporate an asymmetrical lacing for added comfort. The low-cut profile provides you with excellent ankle support. You can have an optimal traction on varied surfaces, due to the non-marking running Contagrip outsoles. With the 3D advanced chassis, you experience a maximized security, motion control, energy management, and protection, providing a more stable and responsive experience. The molded EVA and dual density midsoles provide lightweight cushioning and motion control. The EVA shaped footbed provides an excellent anatomically designed, for support and impact absorption. Get the Salomon XA Pro 3D Ultra 2 Trail-Running Shoes for Women, and enjoy your outdoor exercise sessions. The Women's XA Pro 3D Ultra 2 Shoe from Salomon is a lightweight, durable trail running shoe that has proven itself among athletes around the world. The Sensifit™ system works to provide a precise and secure fit and is optimized for a woman's foot. The body of this shoe is quick drying, breathable mesh which ensures ventilation as you push your limits digging up the trail and jumping over logs. Not limited to running, this is also a solid option for ultralight hikers whose pack-weight doesn't require extra ankle support. Just slip these puppies on, cinch the Quicklaces and you're ready to go. The extra lace tucks into a pouch on the tongue (I had these shoes for over a year before realizing the laces tucked into a pouch. Learn from my mistake). FEATURES of the Salomon Women's XA Pro 3D Ultra 2 Shoe. SPECIFICATIONS of the Salomon Women's XA Pro 3D Ultra 2 Shoe. The ultimate mountain running shoe just keeps getting better with a new energy cell midsole material for improved cushioning. GORE-TEX version.Providing a premium triple density EVA midsole with pronation control, the Salomon XA Pro 3D Ultra Running Shoe for Women gives optimum flex and lightweight cushioning with a wider last and more volume than the traditional XA Pro 3D Ultra. Featuring a 3D Advanced Chassis that delivers close-to-the-ground feeling, this system gives your feet outstanding stability over uneven terrain without losing energy from your stride. Maintaining a precise and secure fit, a Sensifit system works to cradle your foot around each bend in the trail, while a Quickfit asymmetrical lacing system with lace pocket holds a perfect fit. Targeted for quick pursuits, the 3D Ultra features a lightweight and highly breathable sandwich mesh upper, so you can run like your life depended on it. The Salomon XA Pro 3D Ultra 2 GTX trail running shoe for women is light, durable and stable for the most demanding trails, the XA Pro 3D Ultra 2 GTX® has a streamlined profile and great durability with a new outsole design, plus the year round climate comfort of GORE-TEX®. Navigate demanding trails with the Salomon XA Pro 3D Ultra 2 outdoor shoe. This women's trail-running shoe features a streamlined profile with a gusseted tongue, protective rubber toe cap, mud guard and quick-drying breathable mesh. Sensifit™ wrap the foot with a precise, secure fit, while the single-pull Quicklace™ system enhances easy on/off. The Running Contagrip outsole of the Salomon XA Pro 3D Ultra 2 trail shoe provides maximum traction and multi-directional stability on challenging terrain. The Salomon XA Pro 3D Ultra 2 Shoe for Women in Winter Blue/Asphalt/Pop Green offers lightweight durability and stability for the most demanding terrain. Featuring a streamlined profile and aggressive lugged outsole use the XA Pro Ultra 2 for long hikes or runs on uneven trails. The Salomon XA Pro 3D Ultra 2 Shoes are very convenient on the trail. They're made from breathable mesh, and they have a steady platform that keeps you stable on uneven terrain. EVA padding cushions the feet against impact, and 3D chassis prevent the pronation which leads to pain. For even more convenience, Salomon gave the XA Pro a Quicklace system. With one you're cinched up and ready to go. Ideal for outdoor athletes, The Salomon® XA Pro 3D Ultra 2 is the lightweight and durable option that will keep your feet cushioned and comfortable. Breathable mesh uppers feature Sensifit™ thermoplastic urethane overlays to secure insteps and lock heels in place. Polyester linings wick moisture away from feet. contoured Ortholite® insoles enhance comfort and help control odor with an antimicrobial treatment. Kevlar® Quickfit™ lacing system takes just 1 pull for a snug and precise fit. Protective toe and heel caps guard against bumps and abrasion, gusseted tongues keep crud away from your feet. Dual-density EVA midsoles deliver enhanced durability and cushioning for all-day comfort on the run. Thermoplastic urethane control plate protects and stabilizes in all 3 dimensions. Contagrip® outsoles optimizes performance on a variety of surfaces. Running shoe type - Trail. Average weight - 28.2 ounces. Average weight metric - 0.8 kilogram. The Salomon XA Pro 3D Ultra 2 trail running shoe provides light weight and stability for off-road runners looking for high performance over a variety of surfaces. Breathable mesh uppers feature Sensifit™ thermoplastic urethane overlays to secure insteps and lock heels in place. Contoured Ortholite® insoles enhance comfort and help control odor with an antimicrobial treatment. Kevlar® Quickfit™ lacing system takes just one pull for a precise fit; lace pocket hides lacing away for safety. Protective toe and heel caps guard against bumps and abrasion. Gusseted tongues keep debris away from your feet. Dual-density EVA midsole delivers enhanced durability and cushioning for all-day comfort on the run. Thermoplastic urethane control plate protects and stabilizes in all three dimensions. Contagrip® outsole provides optimized performance on mixed terrain, even at high speeds. Wt. 12.0 oz. Everything you need for the perfect trail running shoes are included in the Salomon XA Pro 3D Ultra 2 Gore-Tex shoes. Stability, durability and agility make these stand out from the rest. Featuring Gore-Tex waterproof protection means dry feet through any rain or mud, Ortholite and Molded EVA midsole provides shock absorption and 3D Advanced Chassis provides stability in any uneven terrain. Perfect fit adjustments in seconds with the SensiFit lacing and ContaGrip outsole helps give you mountain goat like grip in any weather. Dry feet and perfect stability will make these your new best friend on the trails. Salomon's XA Pro 3D Ultra 2 Women's Trail Running Shoe is light, durable and stable on the most demanding trails, it gets a streamlined profile and improved durability thanks to their new outsole geometry. This shoe features a Women's specific fit. Lace up the Salomon Women's XA Pro 3D Ultra 2 Trail Running Shoe when you are on your way to pound out some miles after work. The XA is a durable running shoe that has an optimized fit for women. Light, durable and stable on the most demanding trails, the XA Pro 3D Ultra 2 has a streamlined profile, improved durability and aggressive lugged outsole geometry. Women's specific fit. 3 people have already set their own price. These shoes didn't need to be broken in, but I wore them everyday for a week before my trip. These shoes were first tested at Yosemite on the Mist Trail (to the top of Vernal Falls) on very steep, wet, steps and steep dirt paths. The shoes provided great traction and breathed well to keep my feet from getting soaked while stopping for numerous photos on the wettest part of the trail. Two weeks later I was in a completely different environment hiking through Arches National Park. In the 100 degree heat and sand these shoes breathed well to keep my feet from getting too hot and the traction was amazing for crawling up and down smooth rocks. Hiking though sand was incredibly though, especially in the heat and sun, but these light weight shoes helped out a lot. My only complaint is towards the end of my hike on the they're-not-kidding Primitive Loop from Devil's Garden, I was collecting a lot of sand in my shoe. I read that the Gore-Tex version prevents sand and little rocks from entering your shoe, but living in Southern Nevada I cared more about breathability. I ended up stopping twice in a mile to pour sand out of my shoe, but I think that was because I was too tired and just shuffled my feet though the sand at the end. Long winded review, but I hope It encourages others to purchase this shoe. Thank you Backcountry! I had picked up a pair of these on S&C a few years back and it was instant love. I wore them everywhere for everything and they were always up to the task, and kept me comfortable while doing it. Imagine my dismay when the quick lace finally wore through one of the eyelets and I could no longer use them. Finally I decided the time had come to replace them and it was like a cushy homecoming for my feet. The ortholite system is really comfortable and the type box is nice and roomy for running in. I was worried about the size based on other's reviews, and decided to go half a size down (also half a size down from my old pair). I'm glad I did, as they are a perfect fit. Also, they've added plastic to the eyelets, so I can't destroy them by pulling on the laces. Buy them, you won't regret it! I have high arches and very narrow feet. It's difficult to find comfortable trail shoes that fit. Some of Salomon's other styles are much too wide for my feet. This style, however, is great!!! I normally wear a US size 7, but I ordered these in a 6.5 and they are perfect. I do a lot of walking on varied surfaces from pavement to fairly maintained trails and these shoes are stable, yet very comfortable straight out of the box. I love the lacing and find it highly adjustable to comfort level. I hope Salomon continues to make this style. It's one of the few I can wear. Love them. I own the Salomon XA Pro 3D Ultra 2 and a part of the Amphibian Water shoes, and have tried on other Salomon shoes. I wear a size 9, and I know if I order a size 9 it will be true to size. The arch support is excellent, and are roomy in all the right places without feeling too loose. These are so comfortable!! I can wear these all day and forget I have shoes on. I also noticed the ability to walk longer distances and stand for longer periods of time without my feet, legs and back hurting. My search for good shoes is over! I have two other pairs of Salomon for walking my dog in at times rocky, dirt road, uphill terrain. Like the other Salomons, these grip the ground far more securely than an ordinary athletic shoe. If my dog and I chose, we could walk the hills all the way to the Hollywood sign in these! The color and style are trendier than the other two pairs. However, these are a tad tighter than the ordinary lace ups by the same company. The regular lace ups are roomier and cheaper. Just so other buyers know. As always, Zappos provides wonderful, risk free choices! I recently bought this shoe for my mom for Christmas, and she loves them. She is a Varsity Swim Team coach and stands on her feets walking laps and laps around the pool day after day and the support and traction these shoes provide are great for her. 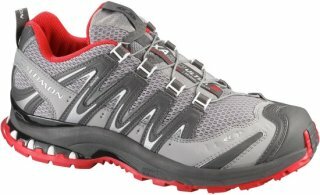 I use mine for light hiking and trail running and find them very comfy and they seem to have great traction. I had them the entire summer and they are holding up great. I highly recommend this shoe. I bought these hikers before a trip to Havasupai, AZ. They felt like I was walking on a cloud from the moment I put them on! I hiked 45 miles in 4 days and never even thought about getting a blister. Even wore them through the river and they dried out and were fine for another 10 miles the next day. The lacing system is a snap. Awesome shoes. I love these shoes! Definitely order at least a half size or whole size smaller, as they run big. I had to send the first pair back. I no longer have to wear my Super Feet inserts with these because they have great arch support. I work out in them and wear them everywhere. Very comfortable. I think I'll be buying Salomon for life now. size down! I bought these same shoes a few years ago and was replacing them with a new pair. However Salomon has changed up the sizing. Now a size 8 is too large for me so I had to return them. Backcountry.com does not have my color in a 7 1/2 so I ended up purchasing elsewhere. I am disappointed that these shoes are too big. I have ordered Salomon in the past and 7.5 was right for me. Not so in this shoe. Too big. I needed to add a insert and even then its not working out so well. I did see a similar post about this and should have listened!! Bummed. This shoe had extra high arches and they didn't seem to be in the correct place. One was further back than the other. I found them to be very uncomfortable. Very high marks to Backcountry for a stellar return program! I read the reviews that this shoe ran big, so I hoped that it would fit my rather wide foot. No such luck. I had to send them back. I live in South America and do a decent amount of hiking/trail walking, and some trail running. I tend to like to wear trail running shoes in the place of hiking boots or shoes. These shoes are well made and I like the way they look, but they are too clunky for me. I found that they felt heavy and big on my feet, and that definitely made my stride awkward when running. Ultimately I think they are a good shoe, just not for me. I loved these shoes for the first six months that I had them...and then the insoles broke down. I put new insoles in, but now the sole is starting to pull away from the shoe. They were very comfortable for my high arched, mildly pronating feet until they started breaking down. I've concluded that they are not good for daily wear, which includes both hiking and running, for more than a year (I've had them 11 months). These were too tight for me. I should have ordered a half size larger. So, I gave them to my daughter, who wears an 8 1/2 size shoe. :( This was a real dissapointment to me, since I have previously bought Saloman hiking shoes and love them.